For the past 10 years, WorldVenture workers have welcomed and witnessed God moving in the hearts of Europe's most vulnerable. In a European church* that has almost doubled in size due to the large influx of Syrian (as well as Afghani, Iranian, and other) refugees, WorldVenture workers Kirk* and Renae* are witnesses to miracles. All around them, people from hard-to-reach places are finding God. It’s a beautiful thing when people once prejudiced against the West and all it represents are welcomed and introduced to a heavenly citizenship that will never go away. And Kirk and Renae get to be a part of these weekly occurrences. But these stories don’t begin in such a heartwarming way. They begin in the middle of the Aegean Sea, on an overcrowded raft that threatens to capsize at any moment. Kirk and Renae knew one Syrian man who journeyed through Turkey with a friend, using smugglers the whole way. While crossing the Aegean Sea at night, the rickety 10-man raft they were on capsized. Everyone drowned, except for him and his friend. If someone is fortunate enough to live through the sea crossing, they usually find themselves holed up somewhere in Eastern Europe in old abandoned buildings, living on nothing, waiting months to complete the next stage of the journey. There’s a reason most of the people making this journey are young men. That’s because the journey itself is very physically challenging and dangerous, not to mention the extra risk of abuses that can happen to women. “No wonder God repeatedly calls His people to ‘love the stranger,” said Kirk. Kirk and Renae have been reaching out to refugees in Europe since 2006, long before images of the drowned Syrian boy caught the world’s attention. They have created a haven of safety, community, and learning at their refugee center, where they offer German classes, sewing classes, an international café, sports, guitar lessons, ceramics, and women’s programs, among other things. They also engage members of local churches in volunteering to help meet the tangible needs of these refugees as they wait for their asylum cases to be processed. Kirk and Renae find many of the refugees they interact with to be spiritually open and hungry: many times they are disillusioned with the radical expressions of Islam that drove them out of their homelands. But what happens when the West isn’t welcoming? Does it push these refugees to turn to a more radical expression of their faith? The opposite, then, is also true. When true believers offer love and compassion to vulnerable, traumatized individuals, the transformation is dramatic. Which makes what Kirk and Renae do all the more important. Renae tells one story about an Afghani woman who fled with her son to escape from the Taliban. While she had made it to Western Europe, her son was stuck in Bulgaria. He couldn’t get through, and it was eating this mother up. Renae simply asked if she could pray in the name of Jesus for this woman and her son. The woman agreed. “The next week he showed up,” said Renae. 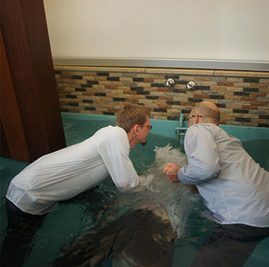 Kirk’s church requires refugees to complete a rigorous baptism class before they can be baptized. While some refugees may exploit the church to gain asylum, many of them are found to be genuine in their conversion. Kirk and Renae been encouraged by the broader evangelical community’s response to the refugee crisis. They encourage American Christians to prepare for even more refugees in America too. WorldVenture has been deeply involved in the refugee crisis, including ways in which missionaries offered aid to Syrian refugees, and what it’s like to live among refugees in Lebanon.